Everyone assumes that one day robotic arms will be dominating human opponents at the inevitable Cyber Olympics. If IBM’s research division has anything to say about it, flying drones could pose the bigger threat to mankind’s gold medal dreams. 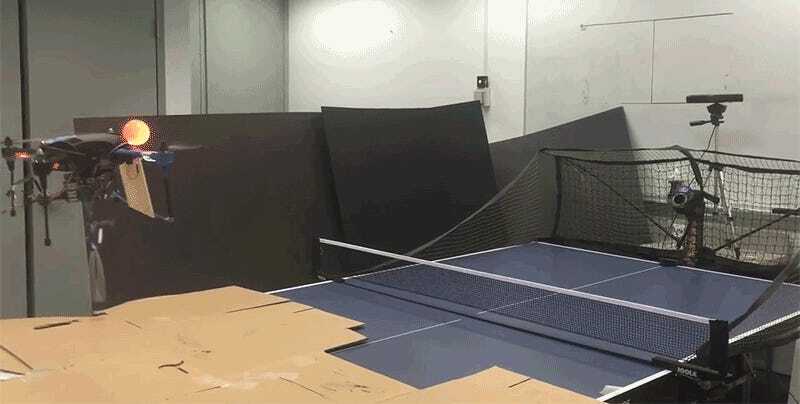 Jae-Eun Park and the rest of the computer vision research team at IBM have successfully taught an IRIS+ drone to track the trajectory of a ping pong ball headed its way, and intercept it in order to return the shot. We have to question whether or not the Cyber Olympics organizers would approve of the cable tether that helps the IRIS+ quickly return to its side of the table, but since they’ll probably be robots too, there’s little chance they won’t.